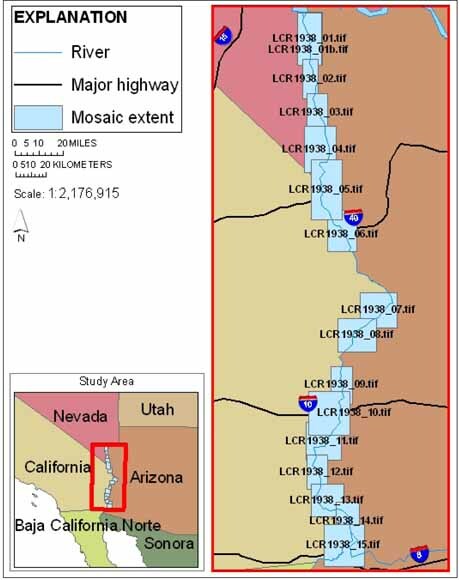 The U.S. Geological Survey (USGS) initiated a study of the Lower Colorado River to derive temporal-change characteristics from the predam period to the present. In this report, we present summary information on accomplishments under a USGS task for the Department of the Interior’s Landscapes in the West project. We discuss our preliminary results in compiling a digital database of geospatial information on the Lower Colorado River and acquisition of data products, and present a geospatial digital dataset of 1938 aerial photography of the river valley. The U.S. Bureau of Reclamation (BOR)’s, Resources Management Office in Boulder City, Nev., provided historical aerial photographs of the river valley from the Hoover Dam to the United States-Mexican border, with some exclusions. USGS authors scanned and mosaicked the photographs, registered the photo mosaics, and created metadata describing each mosaic series, all 15 of which are presented here.